If you LADies are led by Barrack Obama, here are the near options. Lavish location, great wineries, and in-town shopping and dining. It's well-known (for the people who know) as one of the best legacy in culinary. One of the best vacation? Guaranteed! Four Season is one BIG thing. Hawaii is another ONE. Just combine it and we get PERFECTION. Tropical, isolated, and PLUS the Jack Nicklaus signature Hualalai Golf course. First class dining, snorkeling, massage. You're wrong. I'm not a member of Four Season marketing department. I'm just a fan of luxury. Talking about Bali, for me, it is a piece of paradise falling down on earth, separated from other chaos, formed as an island. The magic. The tradition. The sorcerer land. Place of peace. No less. If you're tired of me, talking about Bali blah blah blah, here is another option if you visit Indo. Now, my list is filled by the 2nd destination of Elizabeth Gilbert. Banyan Tree Phuket, never Regret. 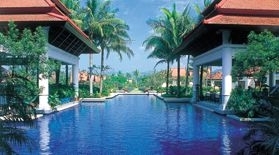 Banyan Tree Hotels and Resorts are also available in Indonesia (YES!! ), China, Korea (South, fellas), Maldives, Mexico, Seychelles (one of top ten list must-visit of mine), and UAE; and upcoming in India, Vietnam, Portugal, and Morocco. Well, good thing must be spread as far as possible, rite? Most of them can be seen and checked in one web. No no. Not fivestaralliance.com. Just visit SignoreFandi.webs.com! !